Wheeler Lake is an impoundment of the Tennessee River that stretches from Guntersville Dam to Wheeler Dam. Boasting a robust and diverse fishery. Wheeler Lake is home to many local and national tournaments, including many professional tournaments. Largemouth bass, smallmouth bass, striped bass and crappie are this lake's most abundant species. The largemouth bass population on Wheeler Lake is very healthy. 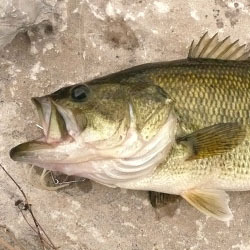 Largemouth bass in the 2-to 3-pound range are quite common with larger fish up to 9 pounds caught annually. In late February pre-spawn largemouth will move into shallow flats and back bays with submerged stumps. The backwaters of First Creek, Mallard Creek and Limestone Creek are excellent locations. Fishing top water lures like Zara Spooks, buzzbaits, and Pop-R's can be very effective. In Summer and fall the largemouth bass will hold in deeper water and move into shallow weedbeds to feed. Submerged hydrilla and milfoil adjacent to deep water are excellent holding areas. Fishing with spinnerbaits, crankbaits and Texas-rigged plastic worms in red, pumpkin or tequila sunrise can be effective. Submerged islands will hold largemouth throughout summer. Fishing diving crankbaits, Carolina-rigged plastic worms or jig combos along the edge of these structures can produce some larger fish. The best smallmouth bass fishing on Wheeler Lake is during the spring spawn. Smallmouth bass will be found bedding in the backwaters of creeks and in shallow pockets, typically near submerged wood and rocky bottoms. Fishing with spinnerbaits, tubes, Zara Spooks or Texas-rigged plastic worms in red and pumpkin can produce some nice fish. In Summer and winter smallmouth will hold in deeper water. They will position themselves in slackwater areas adjacent to current as they wait for forage to swim by. Targeting the slackwater side of ledges, drop-offs and submerged structure, with Carolina-rigged plastic worms, and shad-imitating crankbaits, tubes, jig combos and other bottom bouncing lures can be very effective. Striped bass are found throughout the lake with the average striper weighing 4 to 6 pounds, although many trophy-sized fished in the 20-pound range are caught annually. During spring, striped bass move up the Tennessee River toward Guntersville Dam and to the many smaller tributary creeks. Fishing these areas with live shad, Red Fins or shad-imitating crankbaits will produce fish. After spawning and as the water warms, Wheeler Lake stripers will disperse throughout the lake and can be found deeper. Stripers will be holding near ledges and drop-offs. Trolling live shad in the open waters of the main lake can be productive. Vertically jigging spoons adjacent to drop-offs and ledges can be effective as well. When surface feeding is observed, topwater and shallow-running baits, such as buzzbaits, Zara Spooks, Pop-R's and Husky Jerks, can also be deadly. Crappie are also abundant on Wheeler Lake. The average Wheeler Lake crappie is in the 1-pound range with fish up to 3 pounds being common. Spawning crappie will be found along shallow creek flats covered with stumps. 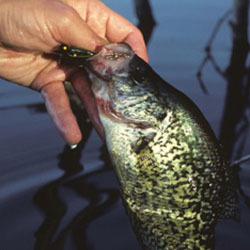 In spring, March through May, Wheeler Lake crappie can be found in Mallard Creek, Limestone Creek and First Creek. Using small minnows or small jig/tube combos rigged under a slip float is an excellent spring crappie tactic. Small in-line spinners, such as a Rooster Tail, and Beetle Spins are also effective for shallow water crappie. As the water warms in early summer, crappie move deeper. They can be found at depths from 10 to 20 feet. They will generally hold above deep weedbeds and stump fields. Fishing these features with red worms, minnows and jig/minnow combos rigged under a float will produce fish. Vertically jigging small crappie jigs in active crappie schools can be deadly. The varied species of catfish are equally abundant throughout the lake. Flathead and blue cats comprise the majority of available species. These fish vary in average size on a yearly basis, but there are fish over 25 pounds taken regularly. Zebra mussels have become established in the waters of Wheeler Lake. All boaters are encouraged to wash their boats before and after using the lake in order to limit the spreading of this invasive species. Each detailed map provides depth, contours, structure, boat ramps, and updated fishing information. 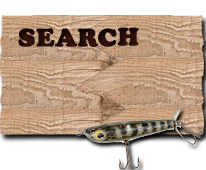 Wheeler Lake fishing maps also include lake info such as gamefish abundance, forage base, water clarity, weedline depth, bottom composition, complete latitude/longitude grid lines and dozens of GPS waypoints & coordinates.